The postpunk bands played and experimental filmmakers gathered amid the faded 1930s and ’40s elegance, where high-end coffee and high-priced organic drinks are now sold. “It was the kind of place you had to know about,” artist and musician G.B. Jones says of the Cabana Room, an upstairs venue off the beaten track in what was the Spadina Hotel on the corner of Toronto’s King Street West and Spadina Avenue. By the late 1990s, the nearly 100-year-old hotel was turned into a youth hostel and fell into disrepair, only to be recently gutted and repurposed as Quantum Coffee and BrainStation, a business offering courses in Web design and programming. Its backers are trying to foster an urbane scene for tech-minded young professionals. In the 1980s, it was a scene created by musicians and artists. 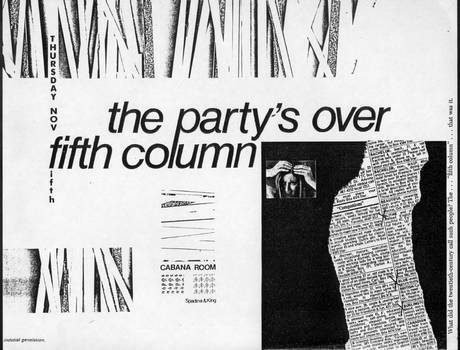 But the upstairs Cabana Room was the focal point, hosting bands such as Fifth Column, a precursor to the riot grrrl movement in which Ms. Jones was mainly a drummer and singer. Experimental groups such as The Party’s Over and the alt-rock Woods are Full of Cuckoos also took the stage. Each were a burst of brilliance, equal to New York’s art punk and No Wave scene at the time. The Cabana Room was also a draw for the busy cassette-tape culture, with bands releasing homemade tapes and compilations, now rare and highly prized. The Art Deco decor, with shades of the downstairs bar, also featured silver poles, Ms. Jones says, which created little enclaves for the bands and the audience full of art students, many of whom lived close by. She lived with bandmate Caroline Azar in a nearby warehouse. “We practised there, and we also had other people practising there. And everyone would just go over to the Cabana Room, because it was literally right around the corner,” she says. By the early 1990s, the scene was ending. Rents rose. The underground was starting to get more mainstream attention, losing its impetus. The cassette culture died. King Street West, with its tech and advertising offices and its more cultivated feel today, is unrecognizable from what it was, Ms. Jones says. Every underground scene inevitably ends. “So you can’t really be too sad about that changing. You have to accept the fact that it’s going to move into a different venue or a different part of the city,” she says.